As I mentioned previously, last week I had the chance to take my kids up to the cottage that my parents rent for an overnighter. It was our first trip of the season, and we arrived in time for a late dinner the first day (a big thank-you to my mom for cooking! ), and we only stayed up until mid-afternoon the second. We still managed to have a nice, relaxing time, though. We started the morning of our second day began with a hearty breakfast that, timing-wise, was really more of a brunch. 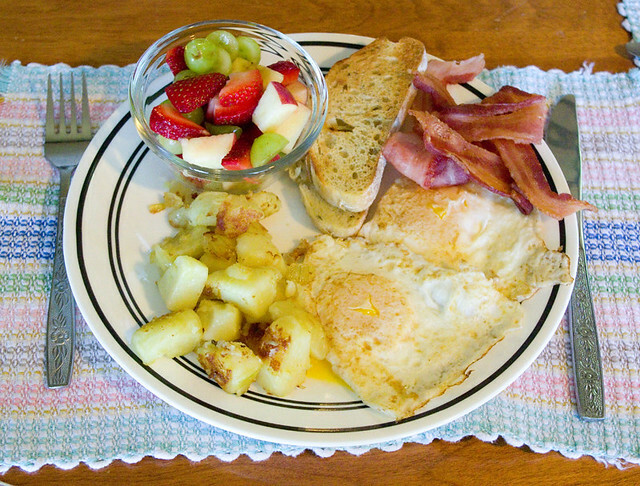 The meal consisted of bacon, eggs (scrambled or over-easy), fresh fruit salad, potato bread toast, and home fries. 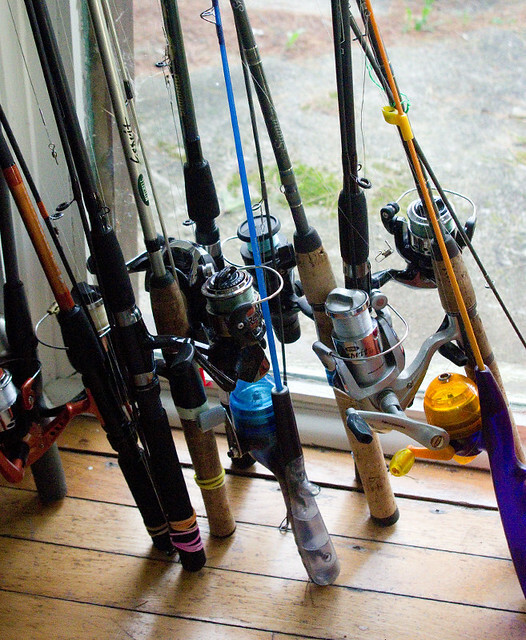 Then it was time for the kids and my dad to break out the fishing rods and head down to the water to try to catch the ever-elusive lake trout, while my mom and I cleaned up. I don’t think anyone caught anything that time. And making my first attempt at teaching the girls how to play marbles. The version I grew up with is what we called “pit marbles” or “hole marbles”, and the rules are similar to these. 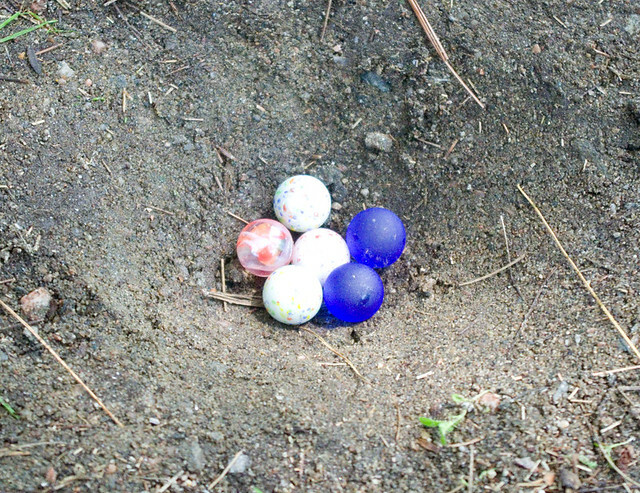 However, in our version the winner gets all of their marbles into the pit first, and billiards- or curling-like tactics are perfectly acceptable. The lake wasn’t really warm enough for a swim, and the air never got above 20°C (68°F) or so anyway, so even the kids weren’t really pushing for a jump in the lake. 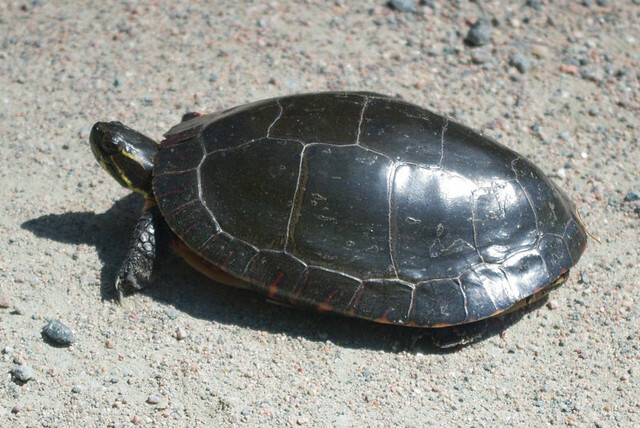 But I did paddle the girls out in the canoe over to a shallow, marshy area of the lake where they could peer under the water and observe the life below. 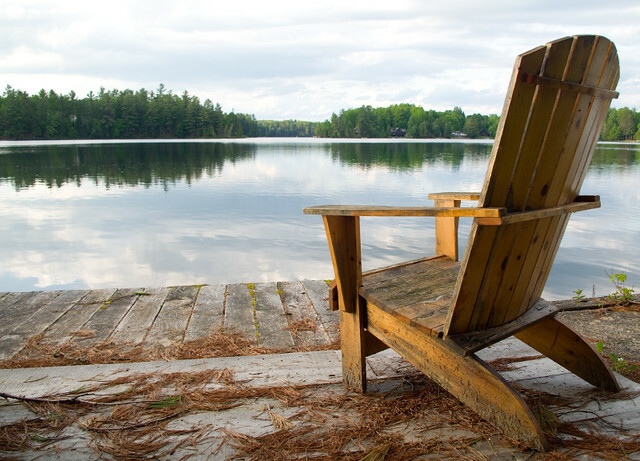 What with busy end-of-school schedules, it doesn’t look like there will be another trip to the cottage for our family before the start of July — but I know we’re all looking forward to the next one!